At first glance, roller derby is about spandex, hard-core pseudonyms and high-speed, full-body contact on roller skates. But there’s more to modern roller derby than meets the eye. Take, for example, Jessica Pellegrini aka Booty Vicious of Silicon Valley Roller Girls. She now skates recreationally, but her legacy at SVRG isn’t her competitive edge. Instead, it’s roller derby-inspired community service—thanks to her education at San Jose State. Pellegrini, ’06 Sociology, developed an interest in volunteering while enrolled in COMM 157, a community action and service class with SJSU Lecturer Christopher Cox. She found her calling for community service while volunteering at Sacred Heart of San Jose for class. 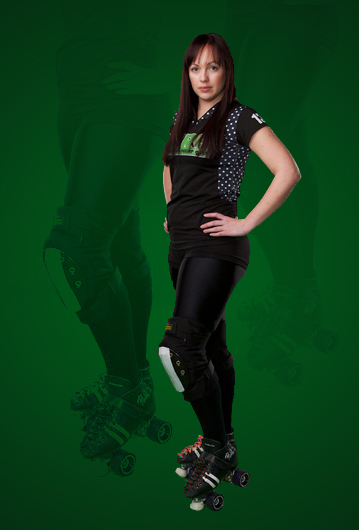 In 2007, Pellegrini joined SVRG and skated competitively for the growing roller derby league. The small team of about 12 women at the time wanted to build a name in the community and eventually become a nonprofit organization. Pellegrini says the 501(C)(3) application is now pending, but it was those early discussions about how the league would achieve its goal that made the difference. Pellegrini’s four years as community service chairwoman were a success. Eight years later, raising money and giving time to the community is still a requirement of membership. The relationships she built with Sacred Heart, West Valley Community Service, Red Cross, Habitat for Humanity, YWCA, Veggielution and others have turned into annual venues for volunteering. SVRG continues to hold monthly events to help members meet their community service requirement for the roller derby season, which is to volunteer at one event between February and October. In 2013, league members contributed more than 380 volunteer hours at events. Pellegrini’s overall mission at SVRG was to increase awareness about community service and inspire derby members and fans, by example, to volunteer. Even junior skaters, age seven to 17, are getting involved, participating in SVRG’s service events. What a great story. Hooray for COMM 157, Booty Vicious, and the SVRG.